August 2018 issue of THE VIRGINIA DEFENDER! 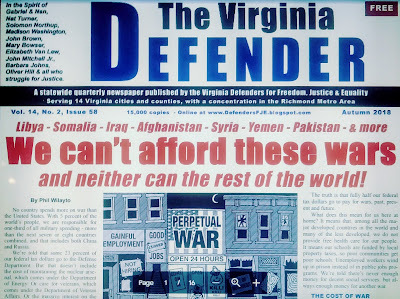 The Autumn 2018 edition of The Virginia Defender newspaper is now on the streets and online: Click "The Virginia Defender" above. This issue features four pages of antiwar and international news. Most people know us for our work around Shockoe Bottom, fighting to reclaim and properly memorialize the Richmond district that was once the epicenter of the U.S. domestic slave trade. Or our work against Confederate monuments, in support of labor unions, opposing police abuse or any of the other domestic issues we struggle around. But the Defenders also play a leading role in the antiwar movement, participating in the leadership of the United National Antiwar Coalition. This summer we represented UNAC at protests at the U.S. Ramstein Air Base on Germany, which plays a key role in the drone warfare that has killed so many innocent people in the Middle East and North Africa; and at the march and conferences held to oppose the North Atlantic Treaty Organization (NATO) during its annual Summit, held this July in Brussels, Belgium. This spring, NATO will hold its 70th anniversary Summit in Washington, D.C. And the date this U.S.-led coalition has chosen for its international planning meeting is April 4 - the anniversary of the assassination of the prophet of peace, the Rev. Martin Luther King, Jr. In response, UNAC and a growing number of allies have called for a major protest on Saturday, March 30, in D.C., and then will join with its member organization Black Alliance for Peace to protest at the NATO Summit itself on April 4, with a BAP-led forum that evening. The Defenders also coordinate UNAC’s Odessa Solidarity Campaign, which supports the relatives of the scores of activists murdered by a fascist-led mob on May 2, 2014, in Odessa, Ukraine. This coming May 2 will mark the 5th anniversary of that massacre, and the OSC is working with the Prague Spring II organization in Sweden to encourage local May 2 actions around the world, to support the relatives’ call for an international investigation into the events of 2014. Those actions will include a protest at the Ukrainian Embassy in Washington, D.C.
Why does a local community organization like the Defenders get involved in these international issues? Because we believe in the slogan “Stop the Wars at Home & Abroad!” Those who work for peace around the world also have to be involved in fighting against the wars here at home: the wars on working people; communities color; women; the LGBTQ community; the environment; immigrants; Muslims; and every other target of the right-wingers in and out of government. And those who work here on these issues have to at least be aware of what the government is doing in our name in other countries. Frankly, this is a lot to take on for an all-volunteer group. We could really use your help. If you believe in building an independent, multi-issue, fighting movement, think about working with the Defenders, either as a member or an ally. Interested? Then please respond to this email. In the struggle for Freedom, Justice and Equality, surrender is out of the question, and failure is not an option. If you feel the same way, please get in touch. We need to talk.